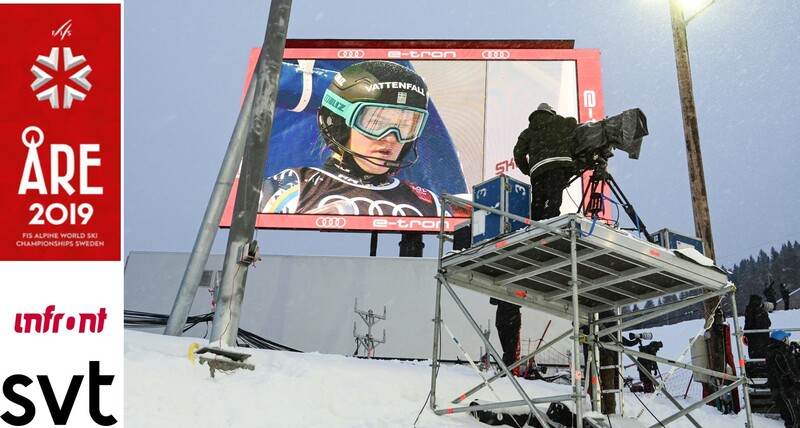 Images from Åre 2019 may reach in excess of 815 million households worldwide. A total of 90 cameras are used to convey the action on and off the slopes to ski fans around the globe through race broadcasting, award ceremonies and studio programs. All the emotions, adrenaline, excitement, joy and disappointment are conveyed through the international signal transmitted by Infront/SVT as the event’s host broadcaster (HB), a partnership between Infront Sports, the TV and marketing rights holder of Åre 2019, and SVT, Swedish National Television.To enable 53 hours of live coverage from Åre, a total of 155 SVT staff are involved in the production. What’s different about Åre 2019 is that it can fit in a rear hatchback car and uses less power than an average house in Sweden in a year (12 000 kWh). Will the Cloud ever be fit for live production? Improving public Cloud delivery. Low latency has always been very important to the broadcast industry, particularly live production, as it ensures the best synchronization between people and equipment. However, in terms of both processing and transport latency, the Cloud is currently unable to offer the same quality as specialized hardware and dedicated networks deliver today. The processing latency is largely the result of CPUs struggling to process in real-time the huge volume of data required for video processing. Fortunately, this challenge can be overcome thanks to field-programmable gate array (FPGA) acceleration capabilities which are becoming part of some Cloud providers’ offering. Patrick van den Berg, co-CEO of EMG, said: "We are excited to welcome Telegenic and its very talented and respected team into the Euro Media Group. This acquisition fully fits within our international growth strategy, and particularly our ambition to consolidate our position in markets with strong potential. It also showcases our ability to attract successful companies into the Group as we look to grow our business. Our aim is to continue expanding in Europe and beyond through both autonomous growth and acquisitions while Telegenic's US activity will allow EMG to further extend its international presence." As the general contractor, Qvest Media will be taking care of all tasks relating to the planning, delivery and implementation of new hardware and software components for the introduction of studio automation at ORF. In addition to the technical integration into the existing studio infrastructure and connection to the Redsys editing system that ORF uses from APA-IT, particular attention will be paid to ensuring the intuitive operability of the automation processes involved and their use in future editorial workflows. To safeguard this fundamental point, Qvest Media’s subsidiary HMS media solutions is adapting its stand-alone, platform-neutral HMS DiSA Brick Controller to suit ORF’s requirements and embedding it as a technology layer between the editing system and the automation systems from Vizrt (Mosart and Opus). “Being an early adopter of IP playout has put our business in a very strong position. We already use iTX for playout at our Toronto facility, so the fact that our staff know how the system interface works is a huge advantage,” said Francois Vaillant, executive director engineering at CBC/Radio-Canada. “Having the same IP technology in Montreal and Toronto means we can unify our workflow between the two locations – sharing expertise between our two language services and simplifying our operation, training and maintenance process.” Grass Valley was selected after a rigorous RFP and shortlisting process for its ability to deliver a robust system that met the broadcaster’s exacting requirements. This investment enables SIS to deliver fast, effortless slow-motion and instant replays, supporting the creation, editing, metadata entry and playback from multiple venues by just two operators. LiveTouch integrates seamlessly with the rest of SIS’s newly automated production workflow, which includes two Grass Valley Kahuna 9600 live production switchers. The new SIS workflow includes a LiveTouch Max 2 server, in a 6 in/4 out configuration, along with two LiveTouch panels. Also included is Grass Valley’s FileFlow engine for transwrapping or transcoding camera and file formats. This setup enables the SIS production team to quickly create replay clips from a range of input sources, storing them for later use or playing them out to a relevant racing channel. Using the Live Touch Controller’s T-Bar, live replay clips can also be slowed down to give viewers more detailed images. To the amazement of 50,000 spectators across the opening weekend of the 2019 Red Bull Air Race season in Abu Dhabi, the 2017 World Champion Yoshihide Muroya (JPN) claimed the race win by just 0.003s over his longtime rival, defending World Champion Martin Sonka of the Czech Republic. The result sets the tone for the eight-race season to come, and with third-place Michael Goulian (USA) just one point behind Sonka in the overall standings, plus 11 other elite contenders in the mix, there is no telling who will be on top at the November finale. Although Abu Dhabi provided beautiful flying conditions, a significant shift in wind direction since Friday’s Qualifying resulted in numerous errors. The opening Round of 14 featured seven head-to-heads, with the fastest of each pair advancing, joined by the Fastest Loser. Sonka and Goulian advanced easily. Professional Audio & Television in close co-operation with Sky Racing Australia (Tabcorp) announced today the successful role out of Lawo’s Virtual Studio Manager (VSM) in Sky Racing’s Sydney and Melbourne sites. Sky Racing is a world leader in multi-venue, multi-channel broadcasting of Australian thoroughbred, harness and greyhound racing, telecasting more than 80,000 races each year to millions of viewers in Australia and around the globe. A pioneer of satellite television in Australia, Sky Racing transmits to more than 5,000 outlets across Australia, and into 51 countries around the world via satellite, cable, mobile and the Internet. The VSM control system brings together all the requirements for a safe and flexible broadcast operation for Sky Racing. Briefed with creating a production on the same scale as a Nicki Minaj or Drake concert, Hazelden took to WYSIWYG to plan a show for the artist, which included a catwalk and a flying stage. “I knew Davido wanted the production to be enormous,” Hazelden says. “As soon as I understood his vision, I began to draw out the rig to make it work for the different areas of stage.” The set heavily featured video content displayed on a 10m x 4.8m video wall. “The Mythos were the main fixture over the stage,” explains Hazelden. “I needed a bright fixture that could punch through the video wall. I used Mythos’ gobos to create a number of different looks, and for each the light was still visible against the video running at 100%.” The Mythos is equipped with two gobo wheels as standard, including six beam reducers. Broadcast live on February 10, the 61st Annual Grammy Awards lived up to its reputation as the biggest music award spectacle in the world, with debut Grammy performances by some of today’s most creative and impactful artists such as Travis Scott, Brandi Carlile and Shawn Mendes. Sennheiser and Neumann played an uncompromising role in the technical success of the event, delivering ultra-reliable wireless performance and sonic purity during each performance. Fresh off of a fiery Super Bowl halftime performance alongside Maroon 5 and Big Boi, Travis Scott performed a medley of songs from his Grammy-nominated album Astroworld, singing through a Sennheiser Digital 6000 / MD 9235 microphone capsule combination. His performances of “Stop Trying to be God” and “No Bystanders” was a sonic and visual spectacle, as he climbed a 15’ high steel cage onstage before leaping into a mosh pit – all the while rapping into his trusted MD 9235 dynamic capsule. At IBC2018, slomo.tv introduced the most compact broadcast grade replay system in the standard replay console – «Ripley». It provided simultaneously: record of 4 HD video channels, play 2 channels and search on all 4 channels. The system had 2 graphical outputs for displaying the main interface (GUI) and selected Multiviewer. In addition to the providing instant replays, «Ripley» could function as a 6-channel videoReferee®, which allowed it to provide video judging for basketball, wrestling, fencing, short track and so on. Whether you’re creating news, elections, sports, entertainment, branding, touchscreen, social media, virtual sets or augmented reality, Ross Video’s XPression is an incredibly scalable solution. From a portable configuration to purpose-built hardware, there is an XPression platform that suits all configurations and applications. Unique to Bexel’s offering, the company custom engineered a compact 4RU 20” chassis to accommodate mobile truck racks where space is always at a premium. As part of the NEP Group, Bexel’s graphics rental capabilities and resources provide better scale to existing NEP clients, reducing shipping costs, minimizing accidental damage, and enabling smoother logistics. Pop-up production and post best describe the flavor of services that FrameTrunk offers its clients. The UK-based company works with broadcasters, production companies and corporations to provide tailored solutions and on-site support for everything from ingest to editorial, cloud-based logging, live streaming, contribution and more. As more clients began to express interest in UltraHD, FrameTrunk revamped its live ingest systems with high-density AJA Corvid 88 video and audio I/O cards, which help manage multiple, high resolution input and output streams. “In the last year, demand for UltraHD among clients has increased significantly. To keep pace and stay competitive, we need to be able to tackle any size resolution or frame rate, and with AJA Corvid 88, we are more than capable. It supports UltraHD 50p and a myriad of other transport standards and frame rates for HD, 2K, UltraHD and 4K delivery,” shared James Hunter, CTO, FrameTrunk. Fulcrum AT/12G server – Now supports more 3G/HD channels. Fulcrum AT/12G was first introduced at NAB Show 2018. Maintaining the leadership in price/functionality ratio among broadcast grade 4K servers, Fulcrum AT/12G started to support more 3G / HD channels. The price remains surprisingly affordable – $60,000. Initially Fulcrum AT/12G provided 442 (4REC+4SEARCH+2PLAY+FX) configuration for all resolutions (4K/3G/HD), the upgraded Fulcrum AT/12G not only supports 442 mode for 4K, but also has 662 and 771 configurations for 3G/HD. This means that the system records 6 or 7 3G/HD channels, plays back 2 channels with the transition effect and simultaneously searches on all 6 or 7 recorded channels. FOR-A will continue to demonstrate its commitment to 12G- and IP-enabled technology during the company's ninth consecutive appearance at CABSAT, being held March 12-14 at the Dubai World Trade Centre. The company is developing IP interfaces and remote-control capability via standard protocols for the 12G products for its existing 3G/HD product line. FOR-A will exhibit in booth C1-20 during the conference. "Our focus at CABSAT will be on delivering the latest innovations across our live production solutions – switchers, servers, routers, and graphics systems that align with our vision of 12G- and IP-enabled productions," said Mr. Takaaki Imoto, Senior General Manager, Overseas Sales & Marketing Division, FOR-A Company Ltd. "Our wide range of technology enables customers to migrate to IP-based operations while protecting their current investment. We’re looking forward to a very successful CABSAT in Dubai next month."